1851 – 37 Worship St. William & Elizabeth (Pooley) Waterhouse lived with infant son William H.
1860 – September 5th, William Waterhouse died at St. Bartholomew’s Hospital in London, and William H Waterhouse (his son) also died of a fever within a matter of days on September 9th. In the previous post, I added a timeline and now I will begin to back it up and break it down to specific events. I must make a correction though, because in the last post I had the birth year for W.H. Waterhouse as 1850, but when checking the sources again it was actually 1849. This little fact also tells us that his mother Elizabeth Maria Pooley was about six months pregnant with him at the time of her marriage to William Waterhouse on June 20th 1849. Source Information: Ancestry.com. London, England, Births and Baptisms, 1813-1906 [database on-line.] Original data: Board of Guardian Records, 1834-1906 and Church of England Parish Registers, 1813-1906. London Metropolitan Archives and Guildhall Library Manuscripts, London. William Henry Waterhouse was born September 15th, 1849. He was baptized on December 26th 1852 (see record above). It seems a common practice for people to wait until Christmas time or the day after for baptisms, and Boxing Day was and is a holiday so it must have been easier for the family to get to church for such occasions. Looking through marriage and baptism records in general, many of them take place on Boxing Day also known as St. Stephen’s Day. William Henry Waterhouse is also in the Birth Marriage Death Free BMD index, the details of his entry are below. 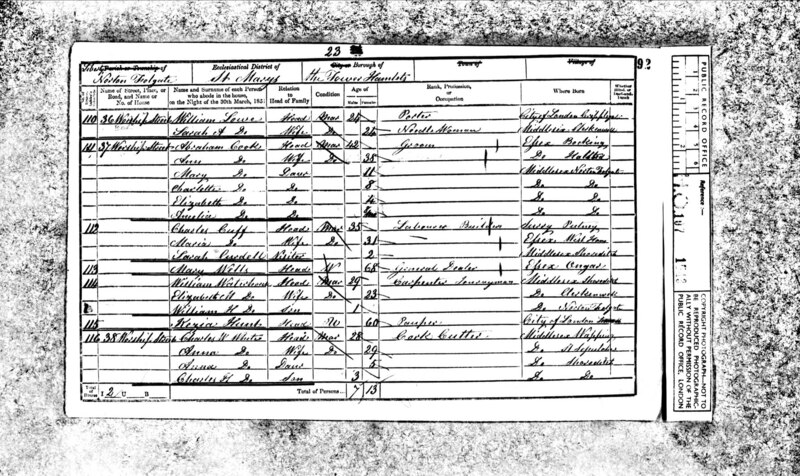 Above you can view the census entry for the William Waterhouse family living at 37 Worship St, Norton Folgate, Middlesex, England. They were one of five families at that residence. William was listed as a Carpenter Journeyman, and the other occupations in the household included Groom, Builder Laborer, General Dealer, and Pauper. St. Bartholomew's Hospital, London, Circa early 19th C. Source: Wikipedia. Unfortunately these details are about all we know about young William Henry Waterhouse. He died September 9th 1860, a mere 6 days before his 11th birthday. He died of a fever at St. Bartholomew’s Hospital in London according to his death certificate, and sadly his father had also passed away days before. William Henry Waterhouse was buried in Shoreditch on September 13th, 1860. It must have been a very difficult time for his mother and sisters. Burial Record for Wm. Henry Waterhouse 1860. Source Citation: City of London Burial Registers, Register:3, Page number: 342, Burial Numbers: 14434 - 14446, Date(s) covered: 13/09/1860. One of my favorite parts about researching genealogy is learning more about the women folk (sorry guys). Upon receiving the copy of Ernest Augustus Needham’s birth certificate, I learned the name of his mother: Elizabeth Waterhouse. I had never heard of the name Waterhouse before in the family. And I never realized at that time how much more there was to learn about her own family tree. This is the beginning of what I have so far. It can get a bit confusing when there were so many generations of Elizabeths. I almost wanted to title this post “back in time” (forgive me the Huey Lewis pun). 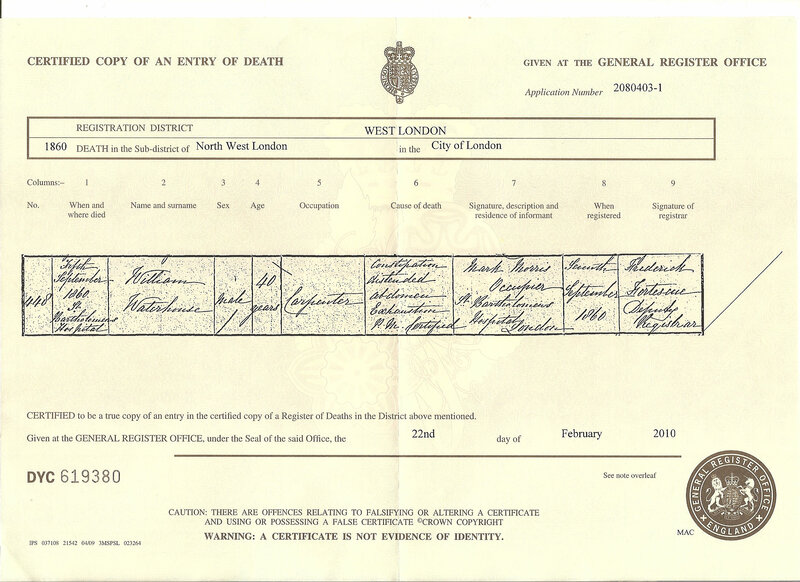 Source Citation: Certified transcription of birth certificate for Elizabeth Waterhouse, Application Number COL 634256, Registered in Whitechapel, London, Middlesex, England. Elizabeth Waterhouse was born in 1855 to Elizabeth Maria (Pooley) and William Waterhouse. They lived at 37 Worship St. in London, England. William was a carpenter and was born in 1819. He was raised in Hackney and is listed on the 1840 Census living with his father John and sisters Amelia and Elizabeth. I will expand upon the Waterhouse and Pooley families in future posts. Elizabeth Maria Pooley married William Waterhouse at St. Paul’s parish Bermondsey in London, in 1849 (see marriage record below). ”] They had the following children: William Henry Waterhouse (b. 1850), Mary Ann Waterhouse (b. 1852), Elizabeth Waterhouse (b. 1855), and Frederick William Waterhouse (b. 1860). Below is a timeline of the Waterhouse family and brings up some heartbreaking losses that hit the family in 1860. The next posts will discuss many of the details in this timeline and give a fuller picture of their lives. 1849 – St. Paul Bermondy Parish, Elizabeth Maria Pooley (age 22) married William Waterhouse (27). The bride lived on Weston St., the groom on Nelson St. in London. On 5 Dec 1860, Frederick William Waterhouse was born to William Waterhouse’s widow Elizabeth Maria (Pooley) Waterhouse. 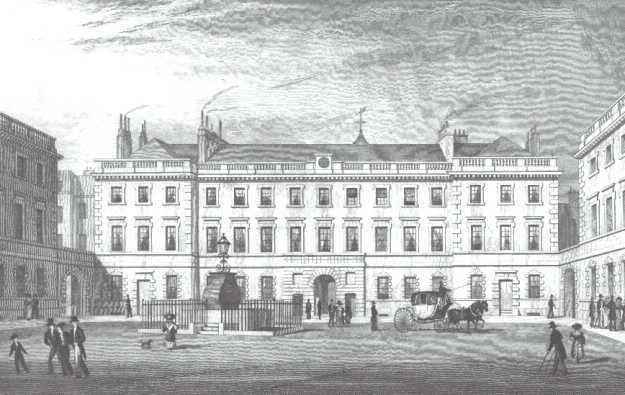 1861 – 4 Axe Place. 6 Feb, two months after his father passed away, Frederick William Waterhouse baptised at private service at St. Leonard’s church in Shoreditch (age 1). Two months later, the family is listed as living in Shoreditch on the 1861 census. Frederick William then 4 months old, with mother and sisters Mary Ann and Elizabeth. Elizabeth (Pooley) Waterhouse was listed as a needlewoman. A bleak situation for this young family, but not the end by far. Elizabeth Needham is listed with the other siblings Leonard, Beatrice, and by this time there are two new additions to the family, Alfred Creed and Christopher. Christopher is listed with his mother’s surname in 1901, yet he was the son of Elizabeth and James Jeremiah Creed. 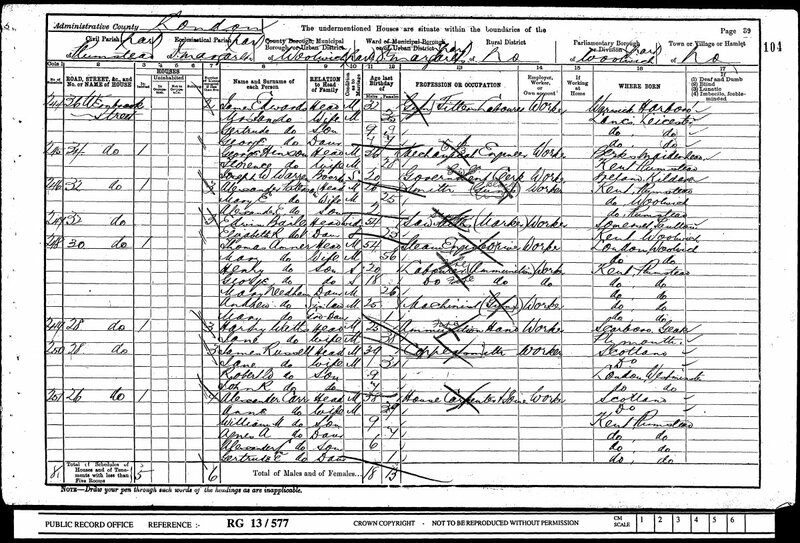 Alfred Creed was born c. 1893 and was eight years old at the time of the census. Nowadays in modern society having kids out of wedlock is often viewed as no big deal. Placing yourself in the time period of Victorian & Edwardian England, you can imagine it was a taboo subject at the time which was probably not talked about. Relationships outside of marriage were also common before divorce became socially acceptable. 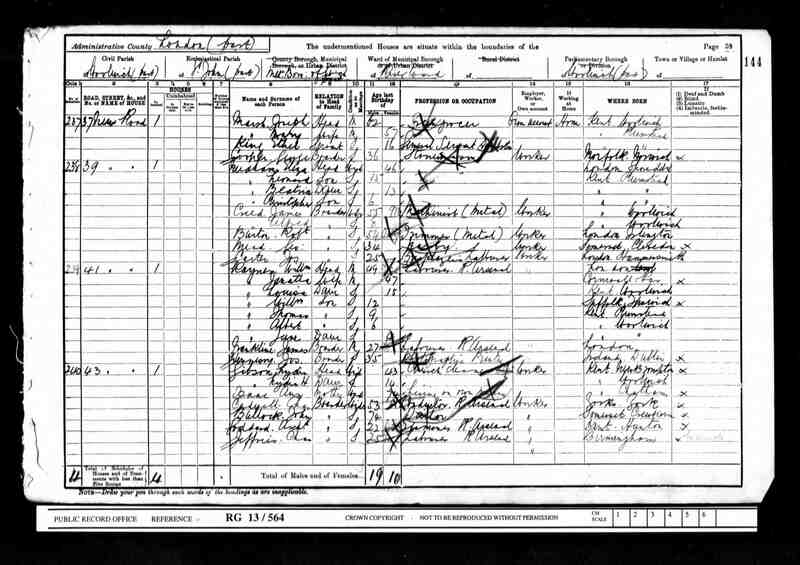 The confusing 1901 UK Census listing for Elizabeth Needham and the Creeds. Source Citation: Class: RG13; Piece: 564; Folio: 144; Page: 39. Ancestry.com. 1901 England Census [database on-line]. Provo, UT, USA: Ancestry.com Operations Inc, 2005.Original data: Census Returns of England and Wales, 1901. Kew, Surrey, England: The National Archives, 1901. James J. Creed married Elizabeth (Waterhouse) Needham later in 1901, a few months after his second wife Mary passed away. Their marriage record contains some errors. Elizabeth Needham’s father’s name was listed as Frederick William Needham. First of all, Elizabeth being a widow named Needham, the father’s name is incorrect. Her father William Waterhouse died when she was five years old, so she may not have remembered all the details, or her husband may have filled out the paperwork. Frederick William Waterhouse was her younger brother. One of the witnesses at the marriage was Elizabeth’s eldest daughter, Elizabeth Ann Needham. Source Citation: London Metropolitan Archives, Saint John, Woolwich, Register of marriages, P97/JN, Item 011. Ancestry.com. London, England, Marriages and Banns, 1754-1921 [database on-line]. 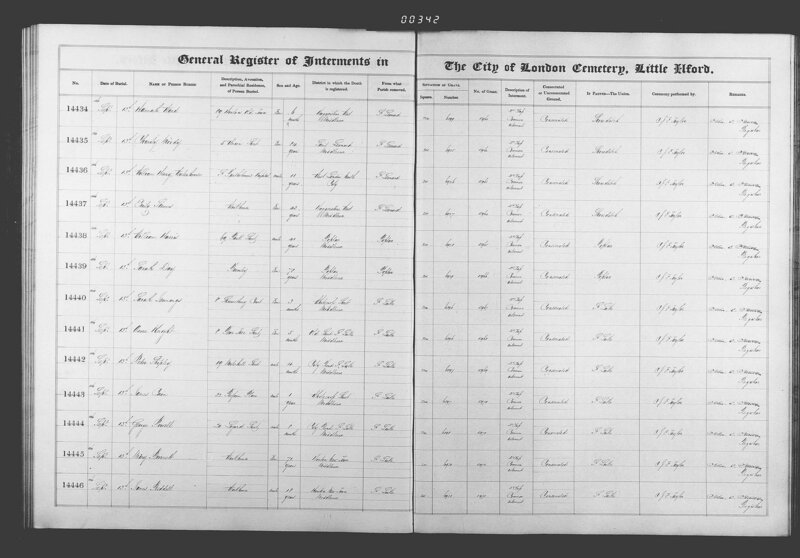 Provo, UT, USA: Ancestry.com Operations, Inc., 2010.Original data: Church of England Parish Registers, 1754-1921. London Metropolitan Archives and Guildhall Library Manuscripts, London. Sincere thanks and credit go to Elaine Foster for giving me many details on our Needham – Creed family connections. James J. Creed and Elizabeth (Waterhouse) Needham Creed were married for twenty years until his death in 1921. 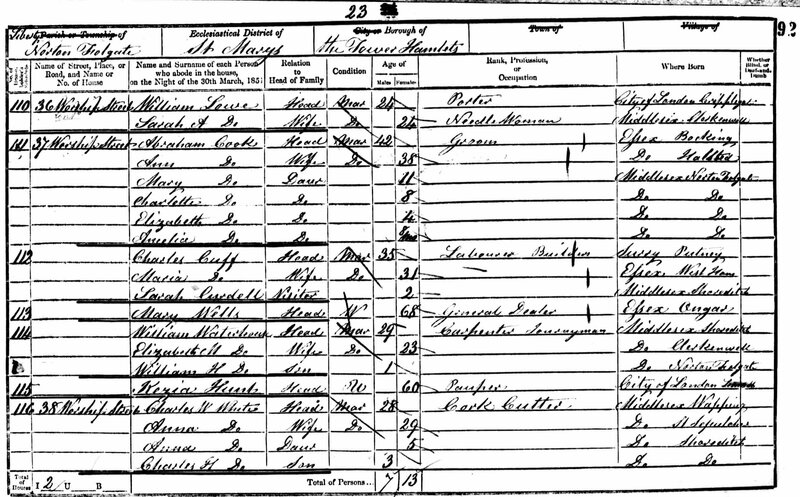 On the 1901 UK Census, the older children of Elizabeth (Waterhouse) Needham: John, Andrew, Elizabeth Ann, Frederick, and Ernest were not listed as living with their mother. I will post about her somewhat confusing census record in Part Two. Like so many families, this was a family of tight knit siblings who were involved in each other’s lives and had to work very hard to overcome hardships and grief together. It was a different time, but these things haven’t changed much at all. Andrew appears on the 1901 Census living in Woolwich, as does his sister Elizabeth Ann, employed as a domestic servant in Kensington, London. I am still searching for the other three sons, and it is possible that Ernest was in the military at the time. There are a few possibilities for John Needham, but the name is very common. If anyone has information on Ernest, Frederick, or John at this time please post a comment and let me know. Andrew Needham married Mary Edith Amner on April 9th, 1898, the daughter of Thomas R. and Mary Amner. The groom and bride were both 22 years old, and F.W. (Frederick William) Needham was a witness at the marriage. Andrew’s profession was a Machinist. He and Mary E. Needham had a daughter, Mary Elizabeth, born May 9th 1899. Mary Elizabeth Needham traveled to the US in 1920. Her parents followed in 1921 although I am not sure if they stayed in the states or were just visiting their family members. From what I could find they were not in the US on the 1930 Census, but of course if their daughter Mary E. Needham married she would have a different surname. Elizabeth Ann Needham on the 1901 UK Census. 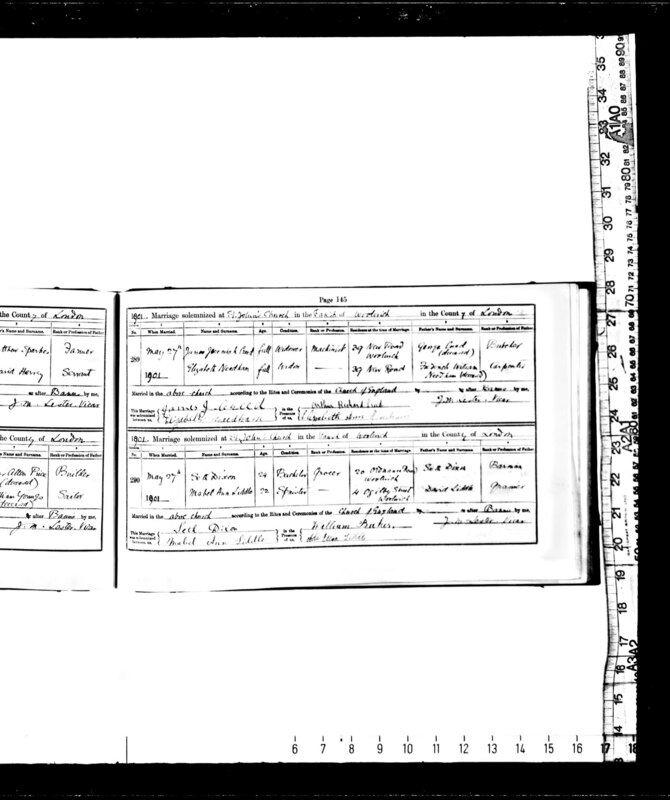 Marriage record for Elizabeth Ann Needham and Henry William Parker. Source: London Metropolitan Archives, Saint Margaret, Plumstead, Register of marriages, P97/MGT, Item 134. Ancestry.com. Elizabeth Ann Needham working as a domestic servant in the household of Charles J. Collings, an artist who later became well known for his paintings of the Canadian wilderness. Although Elizabeth is a common name, her middle initial is used, and the age matches up as well as Plumstead listed as her birthplace. In 1903 she married Henry William Parker, a tinsmith. Thanks very much to Elaine Foster for sharing the marriage information and for the new insights on the Needham and Creed families! They had a son, Henry William Parker, born circa 1905. 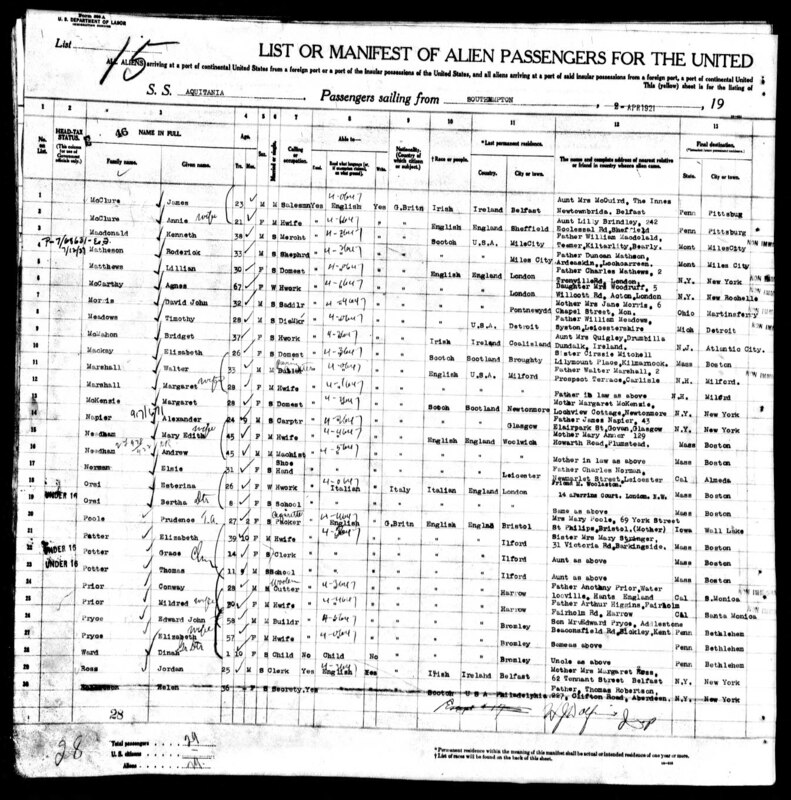 In the early 1920’s the family emigrated to Arlington, Massachusetts, USA, and they can all be found on the 1930 US Census. Henry William Parker the second also lived in Arlington, Mass, near his parents and he and his wife Elizabeth had two daughters: Norma L. Parker born circa 1927 and Shirley J. Parker born circa 1929. A couple of months ago I had no idea that Elizabeth Ann Needham ever left the UK or had a family so it is really cool to know that they lived so very close to Ernest’s branch of the family in Medford, MA, and also because I still live in Massachusetts so this far away family tree just got a lot closer to home. If you have any information on the Parkers I would love to hear from you, so please leave a comment or an e-mail. I added several links on the left hand side of the blog, and added categories for England Genealogy and Victorian London. I may add more categories in the near future (such as other time periods). There are so many interesting blogs and web sites out there. Wikipedia is also a very useful website, and I have found a lot about specific places and churches especially if they no longer exist. For the past few weeks I have been working on writing entries about the Needhams in the 1901 UK Census, and will post these in 2-3 parts soon. Having young kids means editing the blog and working on genealogy at 5-10 minute spurts or during naptime. 🙂 I have recently found out a lot more on the Waterhouse and Pooley families, and am still waiting on several records for the Pooleys and Needhams from the GRO. As my budget allows I am gradually ordering BMD records, so whenever something comes via Royal Mail it is an exciting day as there are sometimes new clues from many of these records. (Click on certificate above to view larger image). Elizabeth Creed, of 22 Burrage Rd Plumstead, died on September 3rd 1948 at St. Nicholas Hospital in Plumstead, England. She was 93 years old. Her next of kin is listed as her youngest son C. (Christopher) Creed of 40 Burrage Rd. Plumstead. She is also described as the widow of James Jeremiah Creed, her 2nd husband who worked at the Woolwich Arsenal and died in the early 1920’s. In the span of her lifetime, 1855-1948, she suffered through personal tragedies, and witnessed many changes in technology as well as two World Wars. I am very curious as to where she lived during the war. Her son Christopher worked in the US during the 1940’s and also came back for a visit in 1960 after his wife Helena F. Creed passed away. I am piecing together records of him and his brother Alfred Creed to include together in a future post. But to get back to the current subject, where did that leave Elizabeth? 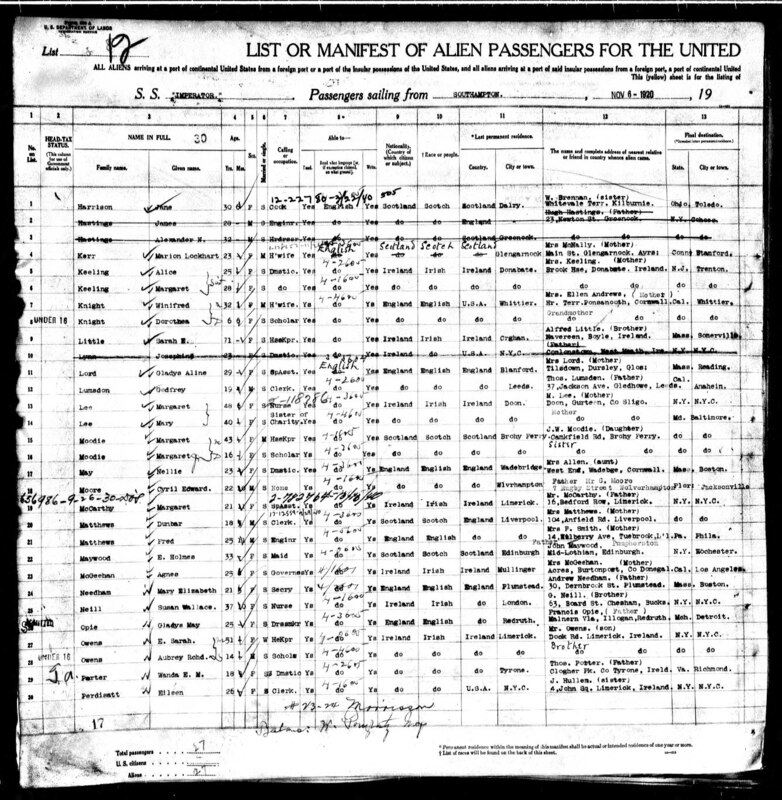 I have only found her in 2 passenger lists traveling between the UK and US, but that was in 1923, the year her son Alfred Creed emigrated to the US. I have not yet found any records to suggest that she was in the US during the War years. The Creed family lived on Burrage St. in Plumstead according to records (census and passenger lists) from 1911 to 1948, so it is possible she lived on Burrage St during the early 1940’s as well. 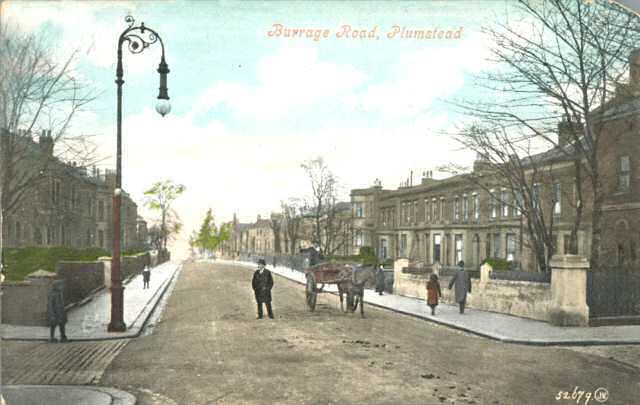 There is a wonderful website called Plumstead Stories, and it also has a book about the local social history which is available to order through the web site. As well as many valuable stories and photos from other time periods, it has many stories of what life was like in Plumstead, England, during the London Blitz. Amazingly, there were two bombs that fell and you can see the remains here as well as maps, scroll down to the ordnance map and you can see how close Burrage Rd. was. The website also has many photographs and great links to learn more about the area. My grandfather Raymond Maxwell Needham also was briefly in London during WWII so I wonder if he had the opportunity to see his grandmother again (they met when he was quite a young boy in 1923). Some of my blog posts will jump around a bit, so now imagine yourself in the US in 1920. 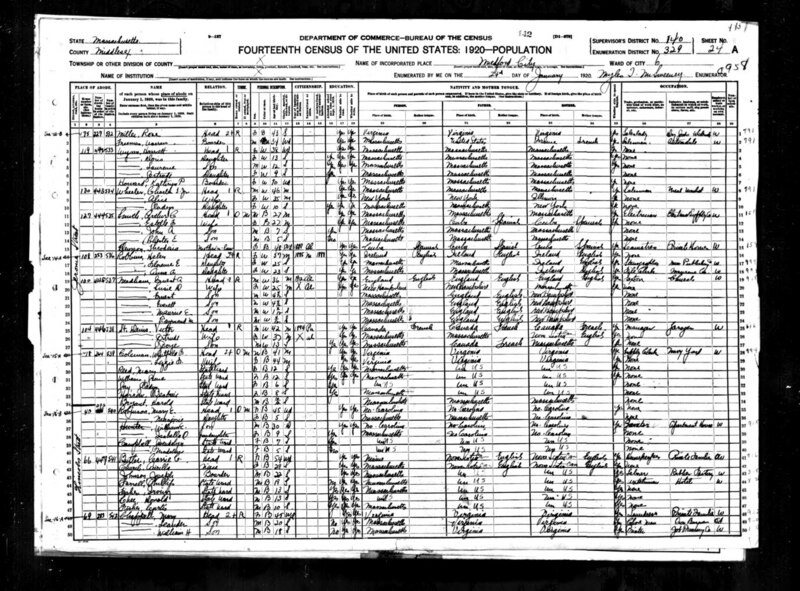 Here is the 1920 US Census entry for Ernest A. Needham and his wife Susie D Needham (formerly Howe), and children Ernest (4), Everett (4), Maurice (1), and Raymond M. Needham (4 months). Ernest was working as Sexton at a church in Boston, MA. In a previous post you can see Ernest Needham’s WWI draft card, so since 1918 two years previously the growing family has moved from Boston to Jerome St. in Medford, MA. 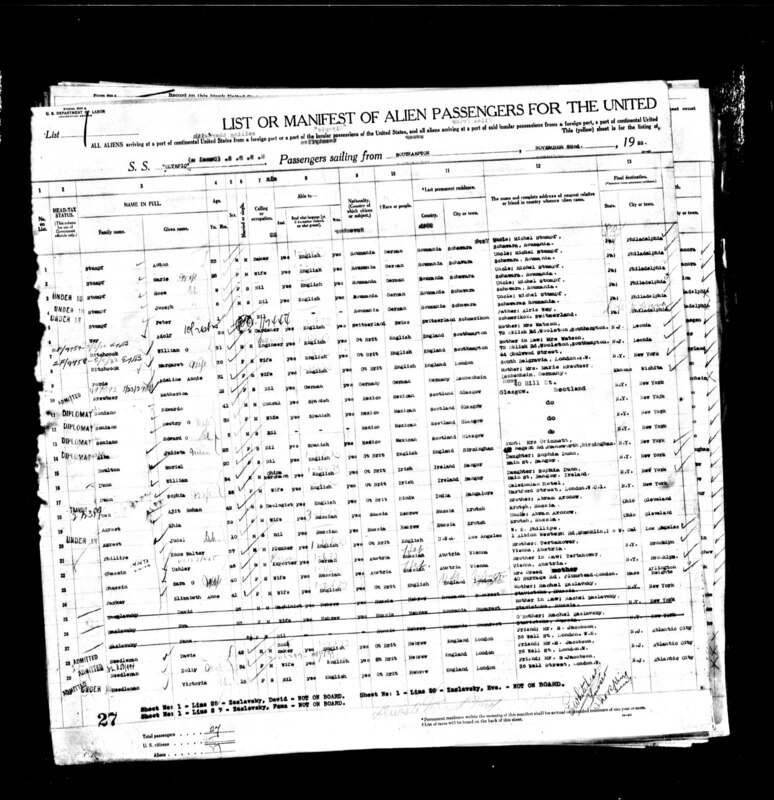 I think it is amusing that the census taker was a bit ahead of himself writing in “Al” (as in alien, not a citizen) for Susie’s naturalization status although she was born in New Hampshire and was about as American as one could be. 🙂 Why did it only work the other way around for women who married citizens? 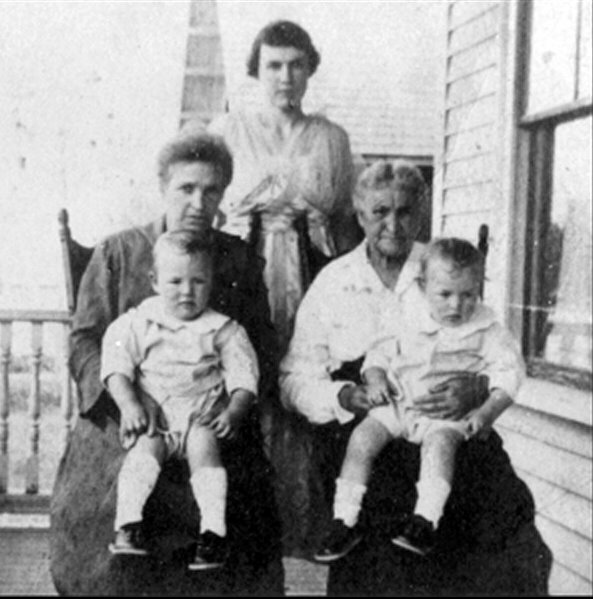 Below is a wonderful photo showing twins Ernie and Everett with their mother Susie D. (Howe) Needham (standing, center), her mother Cora (White) Howe Chute (left, seated), and her grandmother Deborah (Hilt) White (right, seated). Ernie and Everett don’t look older than 2 in this photo so I would assume it was taken around 1917 or 1918. Susie was lovingly known as Grammie Needham to her many grandchildren and great-grandkids. This photo is one that I really love, because I have a similar photo of Grammie Needham (Susie) holding my sister and I many years later in the 1980’s. It really makes me feel connected to the previous generations and really brings the history behind their stories alive. I am thinking of starting another blog devoted to the Howe side of the family, which I would link here and I would discuss these remarkable women in depth. 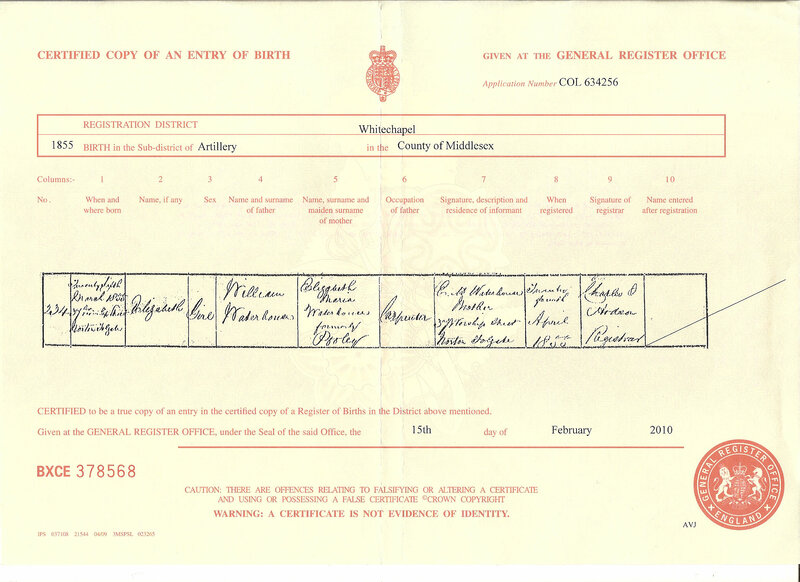 The image above is the marriage record for William Waterhouse and Elizabeth Maria Pooley. (Click on the image to see the full page of records, and they are on the top right hand side). They were married at St. Paul’s Church in the parish of Bermondsey in London on June 20th 1849. The first witness, Amelia Ramsey, formerly Waterhouse, was the groom’s eldest sister. The fathers of both William and Elizabeth were sadly deceased by this time but their names and occupations are listed. John Waterhouse was a carpenter, and Richard Pooley was a silversmith. Marriage records such as this one also give useful hints including the residences at the time of the marriage. St. Paul’s church was located on Kipling St. very close to the bride’s place of residence. These records are also great because we get to see actual signatures. Elizabeth Waterhouse (who would later marry John Needham) was born March 25th, 1855. Her family lived at 37 Worship St., Norton Folgate, London. She was the daughter of William Waterhouse, a carpenter, and Elizabeth Maria (Pooley) Waterhouse. To give some perspective on the geography, Worship St. is about a 10 minute walk from St. Leonard’s Church in Shoreditch, which I will discuss in a future post along with other members of the Waterhouse family. The street still exists, although I am sure it was quite different when the Waterhouse family lived there. I am working on comparing maps from the mid 19th C. to modern day google and multimaps, which is turning into quite a task but it is fascinating to see how much is still the same. 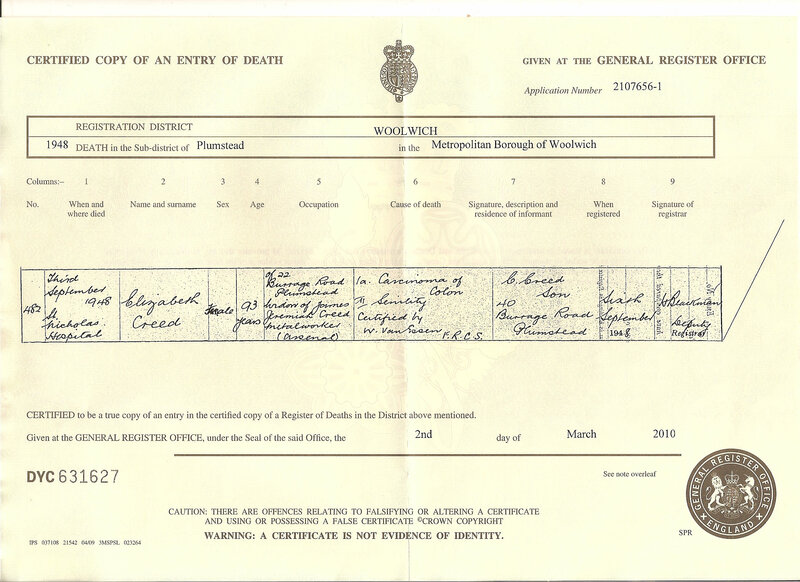 Below is the birth cert for Elizabeth Waterhouse, click the image to see full size. 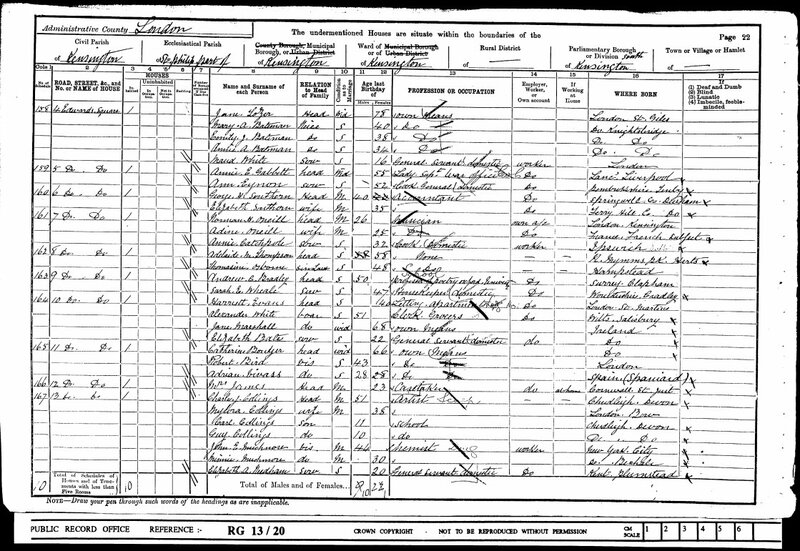 Here is the 1851 Census record of William Waterhouse, his wife Elizabeth M. and son William H. Waterhouse, living at 37 Worship St. His occupation is Journeyman Carpenter. Click to see the full size image. Waterhouse, Creed, Howe, Pooley, Morgan, Norden, and Parker, among others.